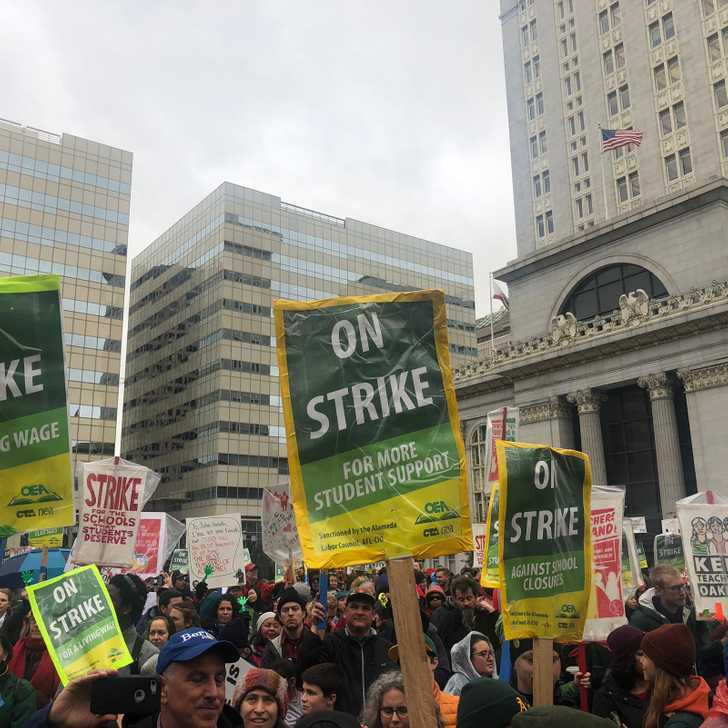 On Sunday, Feb. 24, Majority’s Nick French talked to three teachers from Mission about how they’re supporting Oakland teachers, how the strike has inspired them, and the significance of the picket line. Greg McGarry is an English teacher and co-building representative for the teachers union. Andy Libson teaches physics and chemistry and also serves as building co-representative for the union. Lizzy Dutton teaches algebra. Majority: How have you all been supporting Oakland teachers in their strike? LD: I connected with Greg at California Educators Rising, which we both went to independently. From there, did we end up doing the action during lunch one day? LD: LA. The whole staff, first of all, voted to adopt a school in LA, so we raised funds to support that school during the strike. And we also took a picture to show support, and I think that got circulated around. I feel like that was the first time all year that I’d seen, at a staff meeting, a more general conversation about organizing. And then we voted to adopt Skyline. I’ve been collecting the funds from teachers, which has been pretty successful. AL: I would add that the financial help we gave the school in LA and Skyline — it’s been good to have these schools feel like they’re not isolated, and their story’s getting out there. But in all honesty, I actually think our school has gotten more from this than them. San Francisco hasn’t struck since 1979. There’s immense anxiety and fear that comes from the top, and it disseminates down into the staff. There are those of us who wanted to strike for quite some time, and felt like our union has needed to strike, but we’ve struggled to overcome these fear barriers that our union leaders put into us, and are there just because it’s been so long since we’ve struck. Being connected and hearing the stories of fellow teachers, where we have faces and names and actual stories from them — they write little emails to us about things they’re going through on a given day — it lowers the fear barrier and makes it more likely that, when our time comes, we’ll do the same and strike. This is the first time going on strike for a lot of teachers, so the idea of a picket line may be a little confusing or overwhelming to some people. What would you all say the point of a picket line is? So, going on the picket line puts you in opposition to often times your administration, definitely the district. I was out at Skyline on Thursday, and Alameda County Sheriffs were out there — [Oakland Police] and campus security was out there — and you have to be in opposition to them, and recognize that as a worker your role is going to be oppositional, it’s going to be aggressive, you’re going to be advocating for your rights as a worker and the rights of your students and your community. And advocating that you need more resources, and that there are people who have those resources and they are going to have to give them up. And you’re going to have to do a lot to make sure that they do so. LD: Being new to the profession in general, and as a woman, and very aware that this is a female-dominated workplace — I have a lot of questions about the history of teachers’ strikes. And also strikes in general, and the relationship to gender. A lot of the reasons teachers are treated the way they are is because teaching is a super-gendered profession. Going out on the picket line is a way of asserting back against a lot of the ways that both men and women who are teachers are treated, but because it’s a female-dominated workplace. I’m really looking forward to going tomorrow, and physically being on a picket line with other teachers, and grabbing that energy — especially grabbing that energy from women who are teachers on the picket line. Because I do think it can maybe feel outside our comfort zone, or what we’re gendered into thinking the right way to react to our working conditions is. AL: There’s a lot in education that’s been taken out of our hands. Imposed standardized testing, budgets that are getting cut and we’re having to see colleagues laid off, or jobs consolidated, we see classroom sizes going up: everything about our education process is being taken out of the hands of educators. And a picket line is a way of publicly asserting that we plan on deciding the fate of the school. We’re the ones who are going to decide what happens at this school, and with public education. It’s a symbolic act. What do you think about the idea that the role of a picket line is to stop scabs from coming in, or to stop from students from going to school? How important is it that teachers try to prevent people from coming in? LD: It’s important to physically try to turn people away. I have a friend at either Fremont High School or Oakland High who said she did physically turn some people around. I do think it’s important to prevent people from entering the building. It’s not just a protest you’re doing in front of the school. There’s a reason you’re doing it at your school site and you’re standing at the doorway or the entryway. I’m curious to ask Oakland teachers how much confrontation they had — from what I’ve read it seems that at least on the first day they were super successful, and almost no students were at school. I think that’s a success, and it would not be a success if it’s a more porous thing, where it’s like, “we’re just holding signs.” No, it’s a physical, embodied experience.